August 23, 2010 - Sama Airlines, a Saudi Arabia low-cost airline which is based at King Fahad International Airport, Dammam, the capital of the Eastern Province of Saudi Arabia (the most oil-rich region in the world), will close its doors on Tuesday as a result of mounting debt and their inability to get government and private support. Sama Airlines tried to get government fuel subsidies and price limits on domestic routes but it never materialized and the company incurred 266 million dollars of debt. “We also tried to find strategic investors who are ready to invest in the company and pump the necessary liquidity to enable Sama to operate,” said Bruce Ashby the company’s Chief Executive Officer. Bruce Ashby, CEO of Sama Airlines had over 20 years of experience in airline industry. Ashby was a CEO of a Indian low-fare carrier. He also served at Indigo Airlines. He worked at US Airways Delta and United as a marketing and finance officer. The Sama LelTayaran Company Limited, operating as Sama Airlines, was founded in March 2005, by Investment Enterprises Ltd, chaired by HRH Prince Bandar bin Khalid al Faisal. Initial investment was received from 30 major Saudi private and institutional investors including Olayan Financial Co, Xenel Industries Ltd, Saudi Industrial Services Co, Sara Development Company Ltd and Modern Investment Company for Trade and Industries. The company’s first commercial flight took place March 18, 2007. Sama Airlines is a short haul carrier serving destinations within the Kingdom and nearby countries to include Egypt, Jordan, Syria, Sudan and the UAE with 164 weekly flights. The company has been competing with state owned Saudi Arabian Airlines and low-cost carrier National Air Services. The company name Sama is a verb, with a number of meanings to rise (high), to soar, etc., while in the colloquial Sama refers to the sky or majestic heavens. The airline was initially focused on domestic flights, which was expanded to international markets during 2008. In 2009, in an attempt to improve the company’s financial position, Sama Airlines underwent another major restructuring by dropping less profitable routes and going after the more lucrative markets. The company waived to it passengers on ticket price the fuel surcharges on domestic flights and reduced its fuel charges by 50% on international flights. 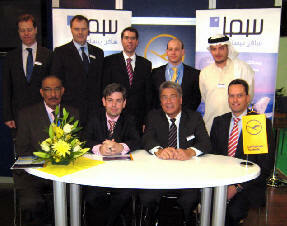 Sama Airlines also partnered with Lufthansa Technik to perform maintenance on its fleet of six Boeing 737-300 aircraft. “Sama chose Lufthansa Technik for their experience in the region and their high standards of quality on technical services for commercial aircraft around the world. We trust this agreement will support our operation’s reliability and efficiency,” said Ashby. The Lufthansa Technik’s contract covered all material operations including pooling, MRO services and the supply with all aircraft materials from consumables and expendables to cabin parts. At that time Sama Airlines brought onboard time the Navitaire Airline Reservation System which enabled the company to access and introduce new and improved functionalities to its passengers. In May of this year Sama Airlines announced new low fare flights to Khartoum, in celebration of launching this new route. Their first flight operated from Jeddah on Monday May 3rd with three frequencies a week; Monday, Wednesday and Friday. It has been reported that the company had signed agreements to purchase 58 Airbus A320s and 12 Boeing 787s in the next three years. Saudi newspaper has reported it has viewed documents from the General Authority of Civil Aviation that indicate Saudi Arabian Airlines “had a desire to buy the institution Sama”, adding Qatar Airways and Air Arabia “have the same desire”.